The Deep Ellum spot hips Dallas to the sushi you hold in your hand. What, actually, is a handroll bar? The answer is not one we could have given six months ago. 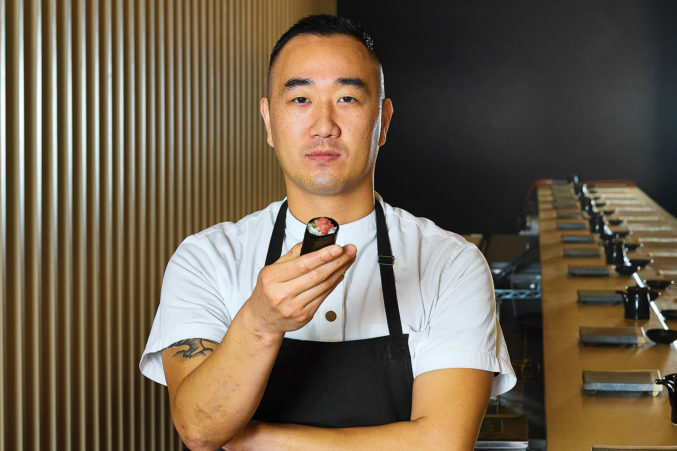 Then, within the space of about a month, two answers presented themselves—Namo in the West Village, Nori in Deep Ellum—each taking on the dish that has become an object of obsession in cities like Los Angeles and New York. A handroll is a cylinder of crisp seaweed that holds warm sushi rice and a tartare of seafood. (The blended texture makes for a softer bite.) The components are by and large those of any high-quality nigiri, and perhaps you have been fortunate enough to have one at the end of an omakase (chef’s choice) tasting. Toasted seaweed emerges from a magic box, kept warm by a single lightbulb, impervious to humidity; it will stay brittle until the last bite. Soft layers of rice and fish are spooned on top. Maybe a sprinkle of toasted sesame seeds. It’s enveloped and handed to you like a gift. the space is tranquil, understated. Park is doing something different with Nori. He is going bigger. Or, at least, louder. Nori is all urban minimalism and big-city chic. I cannot imagine a less appealing greeting than the all-black lobby, like a forbidding waiting room. Guardians at the host stand inform you of the policies—cards only; no tipping necessary. Then you enter. Once past the noren curtain, you pass into the long, narrow main room with a 24-seat counter, a sleek, hip atmosphere, and a playlist of Usher. Servers in t-shirts deliver the crisp, crackling seaweed parcels with their soft filling and plump rice. Chef Jimmy Park is a veteran of several Nobu restaurants. The vegan combinations are uneven: slimy yamaimo (mountain yam) with shiso leaf and a slug of plum; kanpyo gourd, traditionally cured in soy, mirin, and sake, sweet as dessert; kyuri (cucumber), thick-cut, with its tough outer skin. And the handroll offerings steer too far into the creamy for my taste, a few blurring into an indistinguishable pomade. But then there is straight uni, presented on its dark pane of nori, unwrapped so you can admire its melting orange lobe, anointed with gold leaf. One night, I asked for the “starving” set: five rolls, a sequence that took me through steely toro to the final indulgence of the creamier sauces, alongside miso-boosted shishitos and pleasantly dry Tamanohikari Tokusen junmai ginjo sake. The latter comes from a list that’s short but reflects up-and-coming trends, like the complex Drunken Whale and the Hakkaisan with its accents of nuts and stewed fruit. And when the bill came out for under $50, it felt like some kind of fortunate mistake. 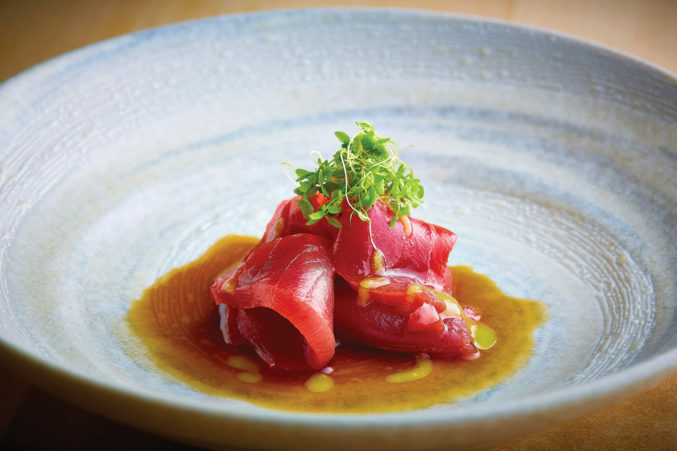 At Nori, sashimi might spotlight Spanish toro. You can treat the long counter like an izakaya—one of Japan’s casual pubs—and sit down to crispy Brussels sprouts, a flutter of charred petals brilliantly showered with Parmesan, a subtle umami tug you can’t at first pin down. House eel sauce and crushed sesame seeds round it out with nuttiness. Pop bits of the confetti fluff into your mouth—sweet and crunchy, it’s just what everybody craves. The buttery yoke of hamachi kama, yellowtail collar, comes dusted with tōgarashi spice and served with lime wedges and ponzu sauce for dipping. I find the flaky inside morsels the ultimate pleasure; crunchy outer bits are bar food par excellence. Those with a tolerance for slime will appreciate takowasa, the pulpy almost-soup of raw octopus and fresh wasabi, garnished with toasted sesame seeds that bring a rich, nutty warmth. And it’s not often you find a menu with the classic mentaiko bowl. Swathed in a generous dollop of creamy cod roe sauce, it highlights the plump rice; I have not found better. For dessert, doughnuts with black sesame speckles (from Park’s cousin’s family business; he receives them daily) proved nothing special. With chocolate ganache and black sesame ice cream, they seemed there just to be there—a sort of party trick. But you are here for handrolls. On one side of you, at this counter conducive to close friends and couples, two women have asked if they can split their hefty rolls, while on the other a duo has brought out phone cameras as they contemplate how to approach the uni’s briny sea-fire. As for me, I’ll be back. But I have to admit, it’ll be for the mentaiko bowl.